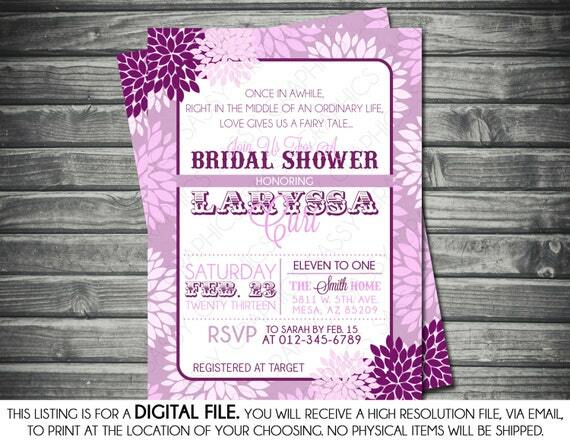 This listing is for a digital, printable, file of a Bridal Shower Invitation - Shades of Purple, Mums, Floral. All the colors and patterns can be changed and the information customized to your specifications. 1. Add this design to your cart and include any changes in the “Note to Seller” section. Then make payment using Direct Checkout or Paypal. 3. Digital files in both JPEG and PDF will be sent via e-mail within 1-3 business days AFTER payment and information is received. You can then request any changes if needed. If no changes are needed, you may print immediately from those files. If changes are needed, please allow 48 hours for updated files to be sent. 4. You can then download the files to your computer and choose a place for printing. You may choose to print at a print shop, photo center, or even from your home printer. I can also make party coordinates to match any invitation such as water bottle wrappers, cupcake toppers, banners, thank you cards, rsvp cards, candy bar wrappers, favor tags, etc. Send me an email or convo for more information. If you have any questions, please send me a convo or email and I’ll be happy to answer them for you! Connect with me on Facebook to learn about promotions and chances to win free design services!